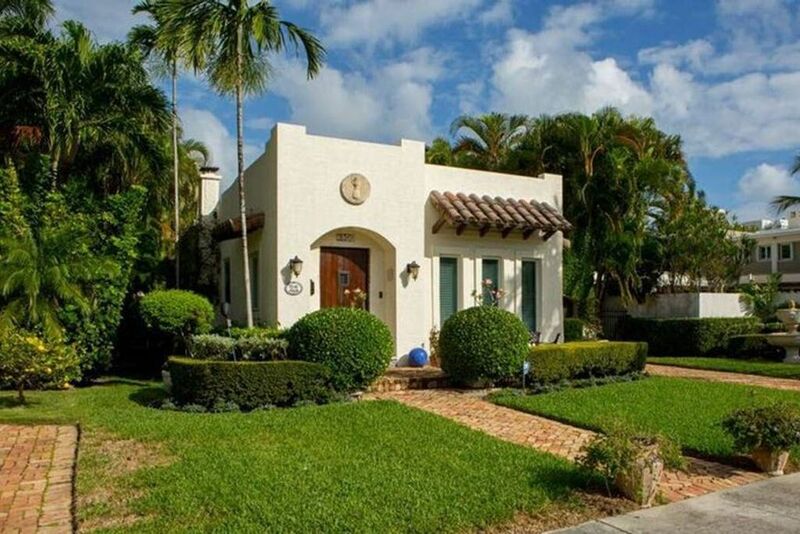 Évadez-vous dans l'un des quartiers les plus beaux et les plus charmants de Fort Lauderdale. La véranda avant, l'endroit le plus idyllique, dispose de 2 lits de repos de grande qualité. Toute la maison est meublée avec goût et confortable, combinée avec la vie en plein air à son meilleur. La terrasse arrière comprend une piscine chauffée avec un nouveau gril à gaz pour les soirées de détente à la maison. La cuisine bien équipée a tout ce que vous pourriez souhaiter et dispose d'une cuisine à gaz. Situé à seulement une maison de la voie navigable Intracoastal, profitez d'une promenade courte de la plage ou des magasins et restaurants célèbres sur le boulevard Las Olas. Les maisons voisines louent jusqu'à 5 fois ce prix. Mots-clés: Cette maison de charme de 1500 pieds carrés a 2 chambres et 2 salles de bain complètes. La chambre principale donne sur une belle piscine. Such a wonderful place to stay. Beautiful heated pool and adorable spanish style cottage. Plenty of room and a great kitchen. Very private and quiet, safe neighborhood. Definitely hope its available the next time we're visiting!!! Thanks so much for your kind words. I feel the same way about my hike and neighborhood but it is always nice to hear it from a third party. Please come again and often, and thanks for taking such good care of my home. We greatly enjoyed the house - the setup is perfect for two couples because we each had our own bathrooms. The TVs in each bedroom were a plus. Everything was clean and neat and we really appreciated the abundant towel supply. The backyard and pool was lovely - we hung out there quite a bit to read, take a dip in the pool and to enjoy cocktail hour. The location of the house made it easy to walk to the beach - just over the bridge. We even walked to the downtown Los Olas neighborhood, although it's very easy to get a cheap Uber or Lyft. Many thanks to our host Paul who was great. Thank oh so much! It was such a pleasure communicating with you and I am so glad you enjoyed your stay!!! restaurants along Los Olas. The home offers a private backyard featuring a pool and gardens. We loved spending so much of our time both indoors and outdoors. Paul has provisioned the home with an abundance of linens, towels, gourmet kitchen equipment and much more. We didn’t lack for anything. For those unfamiliar with Fort Lauderdale this is one of the most special neighborhoods surrounded by water and luxurious multi-million dollar homes. If you’re a dog owner like us you’ll enjoy taking your pooch for a walk and enjoying the beautiful water views. My only regret is our visit is shortly over. I hope you will enjoy Casa Paulo as much as we did. Thanks so so much. Thanks for understanding the few things that are out of my control such as neighborhood construction as people rush to build bugger and better homes in such a special location. I vow to keep my home as charming as possible while the rest of the world seems to want Mega mansions. I hope you will visit again and again. It has been a pleasure. Really liked this property! Only the second time I used VRBO. 17 years straight I brought my yacht down to Florida from NY so I don’t like hotels! The Tucson Spanish decor, furniture, openness flow was really nice & soothing. I love to cook & bbq. This place had all the pots , pans , steamer , every utensil needed. Every kind of plates, platters, bowls big and small. Perfect for me. Even nice china. Beds were comfy. Master bedroom leads right out to patio & pool. Talked to Paul the owner & was very appeasing & a good guy. The only thing was my friend had a problem with the guest shower which I didn’t even check out for myself but let Paul know. He didn’t know about it but could tell he’d get right on it. Could be my friend didn’t know how to use it. Lol . If you like to cook, like Spanish Tuscan, 3 minutes to the Fort Lauderdale strip & 3 mins to los Olas strip , this is great place. Already trying to get another date there. Thanks somynxh and I’m glad you enjoyed everything ! Guest bathroom was custom designed with custom hardware. If you had asked me inxoht have told you to turn center know but I’m glad it all worked out! Hope you will visit again soon and thanks for taking such good care of my home ! We loved the house and location. The place was very clean and well furnished in a warm, comfortable and nicely eclectic motif. The back yard was private with a wonderful pool. We would definitely rent it again!!! Thank you so much for the kind words. I’m glad you enjoyed your stay and look forward to having you stay again soon. You were awesome. Great place, awesome pool. Close to everything. No complaints. We’ll be back! I look forward to hosting you again !! À distance de marche des restaurants et de la plage. La maison est entourée de belles maisons et à proximité de la voie navigable Intracoastal.